As part of an ongoing study involving Apple Watch and Android Wear users, researchers at app developer Cardiogram and the University of California, San Francisco, trained a deep neural network called DeepHeart to distinguish people with and without diabetes at an accuracy of 85 percent. The collaborative study pulled from 14,011 Cardiogram users enrolled with the UCSF Health eHeart Study to obtain 33,628 person-weeks of health sensor data. This information was used to train DeepHeart, which was presented with samples from people with and without diabetes, hypertension, sleep apnea, atrial fibrillation and high cholesterol, according to Cardiogram co-founder Johnson Hsieh. "Typical deep learning algorithms are data-hungry, requiring millions of labeled examples, but in medicine, each label represents a human life at risk — for example, a person who recently suffered a heart attack or experienced an abnormal heart rhythm," Hsieh said in a prepared statement. "To solve this challenge, researchers applied two semi-supervised deep learning techniques ('unsupervised sequence pretraining' and 'weakly-supervised heuristic pretraining') which made use of both labeled and unlabeled heart rate data to improve accuracy." Hsieh notes a correlation between diabetes and a body's autonomic nervous system allows DeepHeart to detect the disease through heart rate readings. Specifically, as people develop early stage diabetes, their pattern of heart rate variability shifts in measurable ways. Findings from the study and subsequent research paper (PDF link) were presented at the Thirty-Second AAAI Conference on Artificial Intelligence (AAAI-18) in New Orleans on Wednesday. Cardiogram's latest study arrives amid rumors that Apple is developing noninvasive glucose sensors for integration in a future Apple Watch device. Considered a "holy grail" of modern medical science, such a system would allow diabetics to continuously monitor sugar levels without performing blood draws. According to the most recent reports, however, the glucose sensing technology is years away from release. "If Apple includes a glucose monitor in the next Watch, we'll be the first developers to try it," Ballinger said. "We designed DeepHeart to be both multi-task (able to detect multiple health conditions) and multi-channel (able to incorporate multiple sensor data streams) for exactly that reason." Actively used by more than a quarter million people, Cardiogram has been able to apply DeepHeart to detect a number of heart-related conditions using consumer grade hardware. 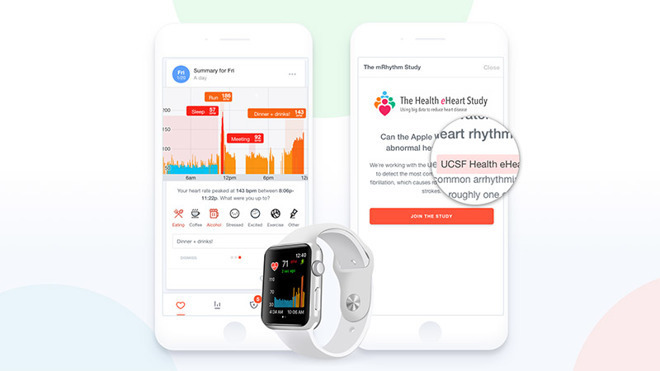 Most recently, Cardiogram and UCSF researchers last May demonstrated Apple Watch can detect atrial fibrillation, a common heart arrhythmia that can lead to stroke, with a 97 percent accuracy. A few months later, Apple itself teamed up with Stanford on its own atrial fibrillation detection program called the Heart Health Study. Cardiogram is a free 55.2MB download from the iOS App Store.